The salad was a favorite at the country club where I worked before coming to Golden Living, and I wanted to bring that same custom approach to the sandwiches we offered here. We menu it at least once a month and sell over 200 during a 2 1/2-hour lunch time frame. Warm tortilla. On bottom third, layer spring mix, eggs, cheddar, blue cheese, olives, tomatoes, chicken and bacon. Drizzle on customer’s choice of dressing (our most popular are ranch and honey mustard). 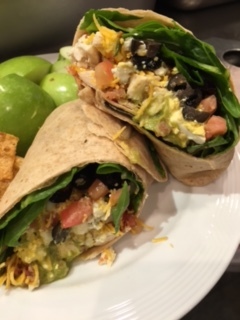 Tuck and roll as you would a burrito, slice on the diagonal, and serve with chips and fruit.